Fotos. Power Supply AT Power Supply AT Power Connectors. 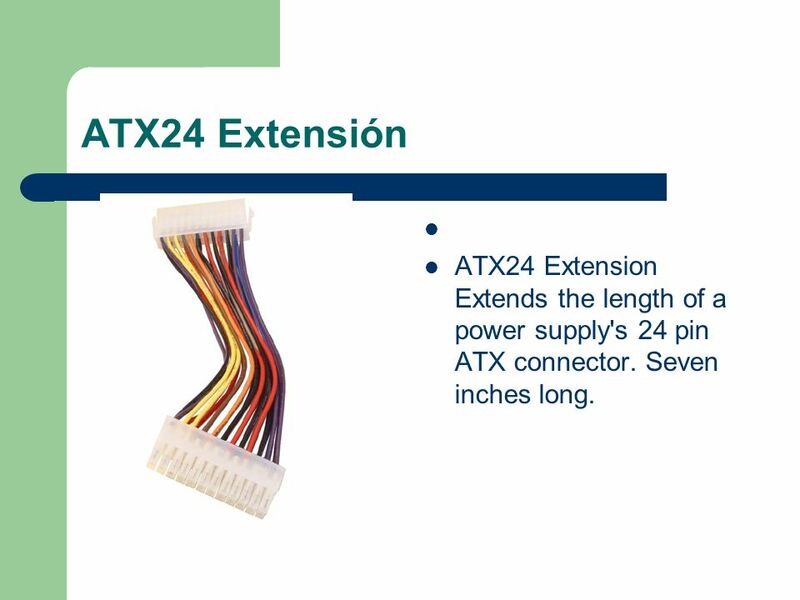 8 ATX24 Extensión ATX24 Extension Extends the length of a power supply's 24 pin ATX connector. Seven inches long. 9 Converts two drive connectors to 6 pin PCI Express power connector. 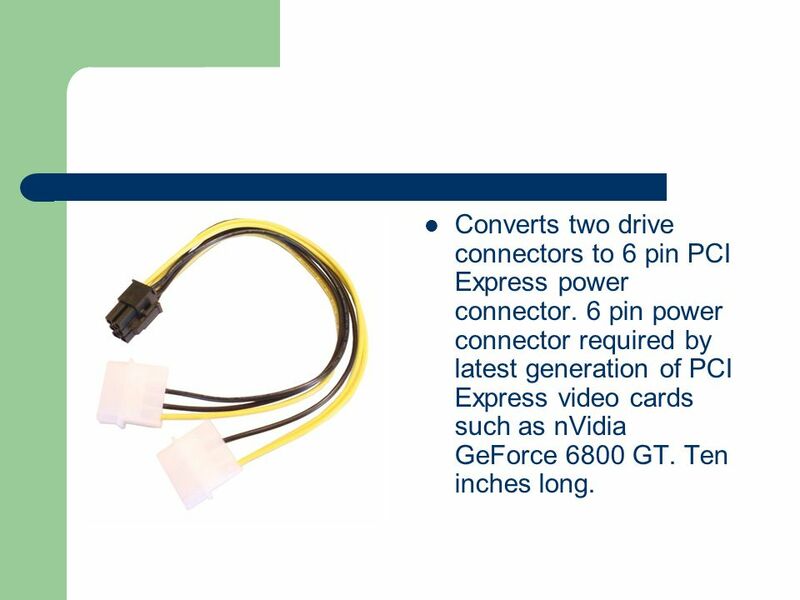 6 pin power connector required by latest generation of PCI Express video cards such as nVidia GeForce 6800 GT. Ten inches long. 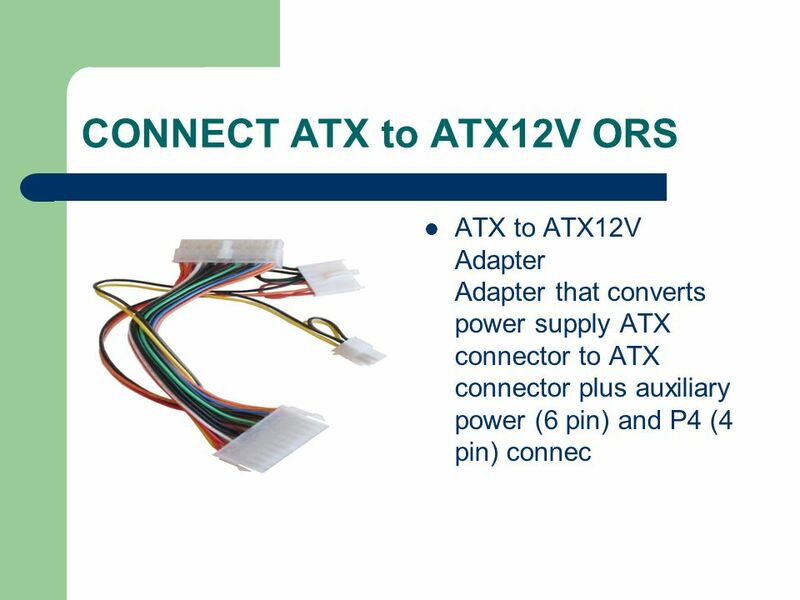 10 ATX to AT Adapter ATX to AT Adapter Converts power supply 20 pin ATX connector to P8/P9 AT connectors plus P10 auxiliary power connector. 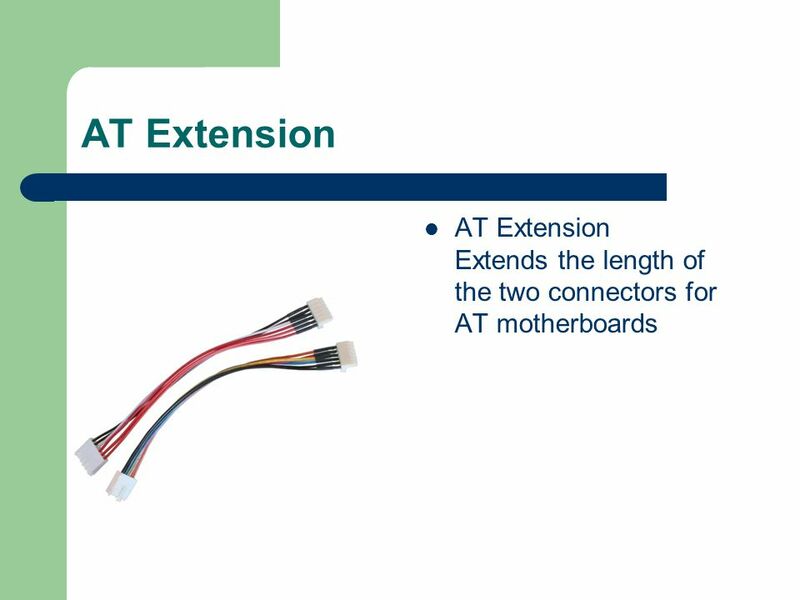 Auxiliary connector provides +3.3V required by some hybrid AT boards. 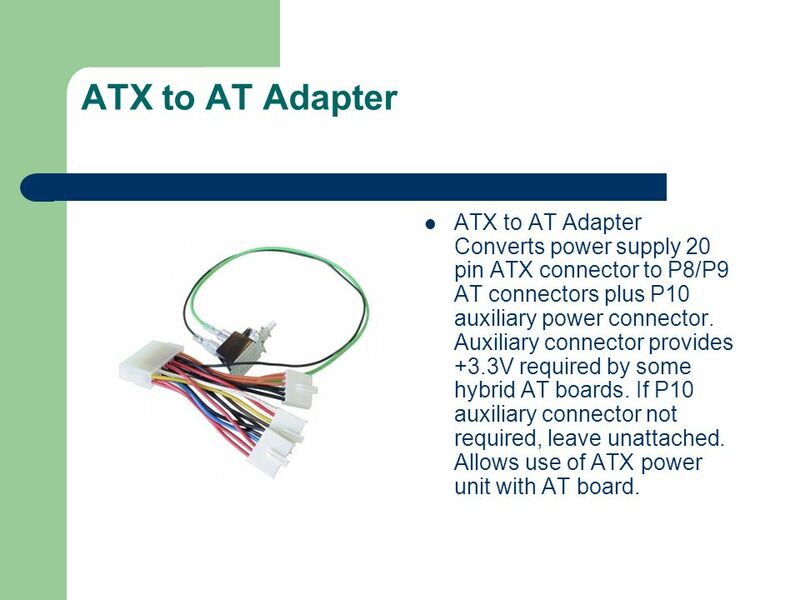 If P10 auxiliary connector not required, leave unattached. 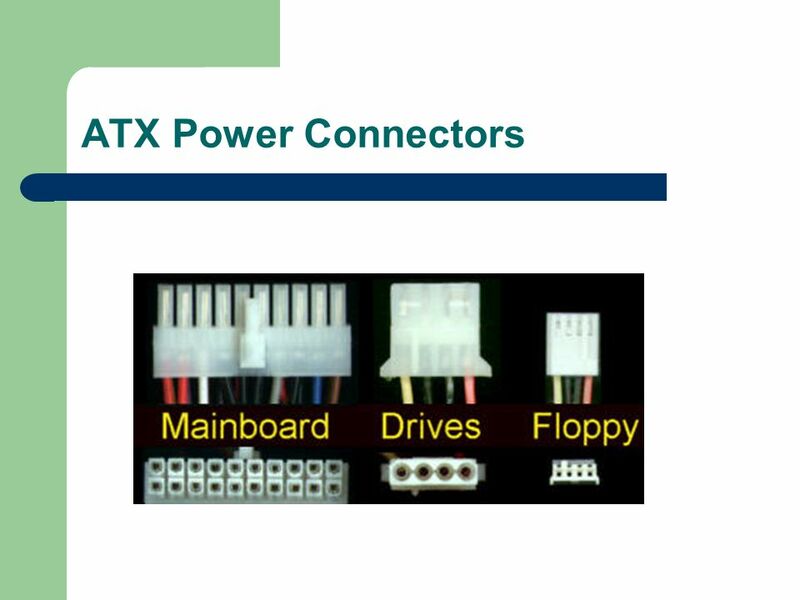 Allows use of ATX power unit with AT board. 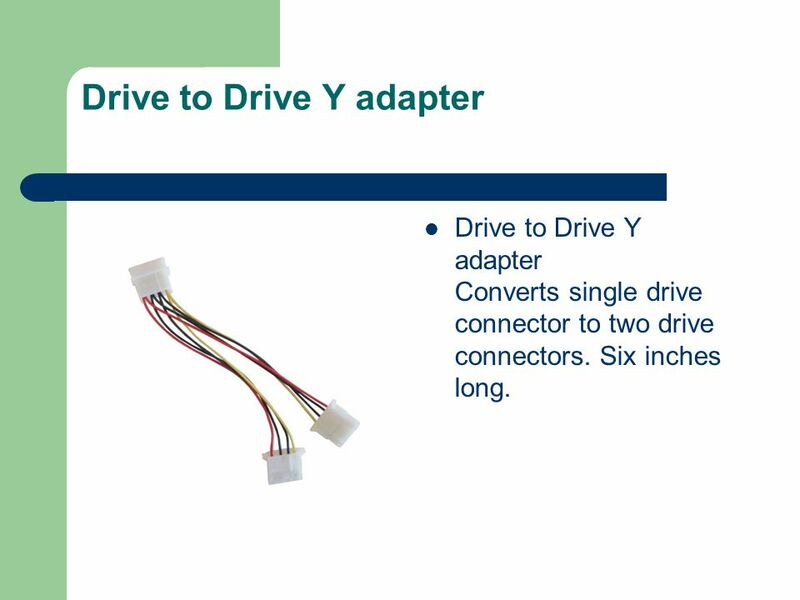 11 Drive to Drive Y adapter Drive to Drive Y adapter Converts single drive connector to two drive connectors. Six inches long. 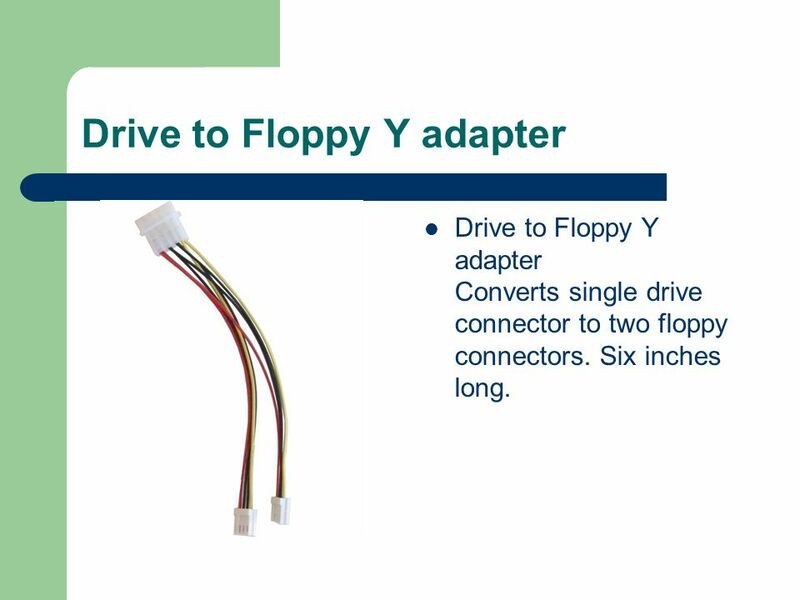 12 Drive to Floppy Y adapter Drive to Floppy Y adapter Converts single drive connector to two floppy connectors. Six inches long. Download ppt "Fotos. Power Supply AT Power Supply AT Power Connectors." Premio 845D and 845MD Training Premio S650 Desktop Product Training By Calvin Chen Technical Director. Jason Brown Kevin Keating 04/23/2013. Lab #2- Computer Lab Jason Brown Kevin Keating Date: 04/23/2013 Tools: Philips Screwdriver Parts: Used Computer. 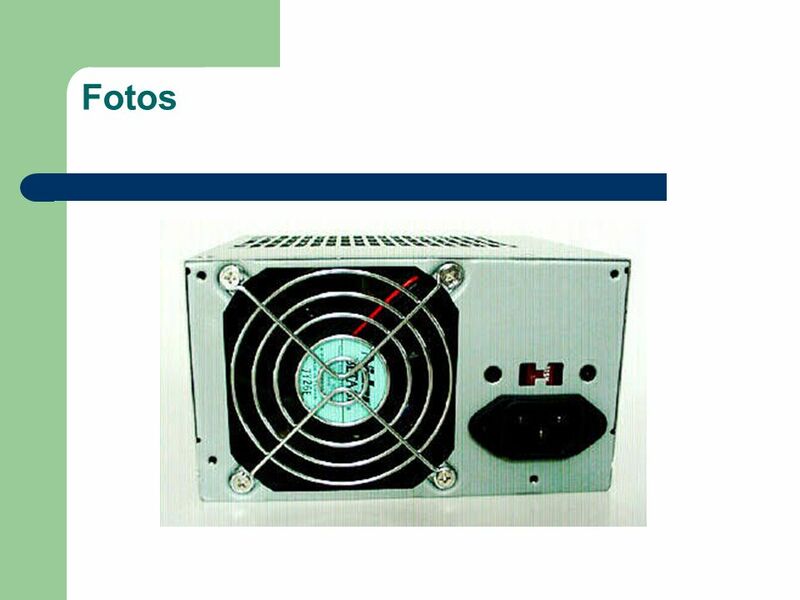 EET 450 – Advanced Digital Chapter 24 Power. 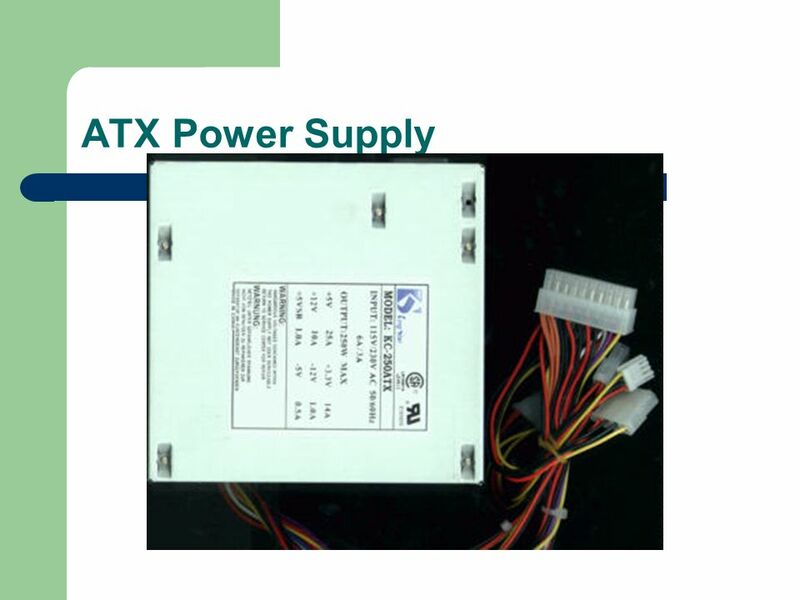 Power Supplies Power conversion Performs a voltage conversion from either 120vAC to desired or 12vDC to desired. Michael Cooper and Troy Davis. Form Factors  The form factor of motherboards pertains to the size and shape of the board. It also describes the physical. Chapter 3 Computer Assembly. 3. Introduction Assembling computers is a large part of a technician's job. This Chapter will teach you how to work in a.
Palitha Baddegama Presented by IT Club of Hingurakgoda Educational Zone 1. By Jono, Phil, Dan, Gareth. 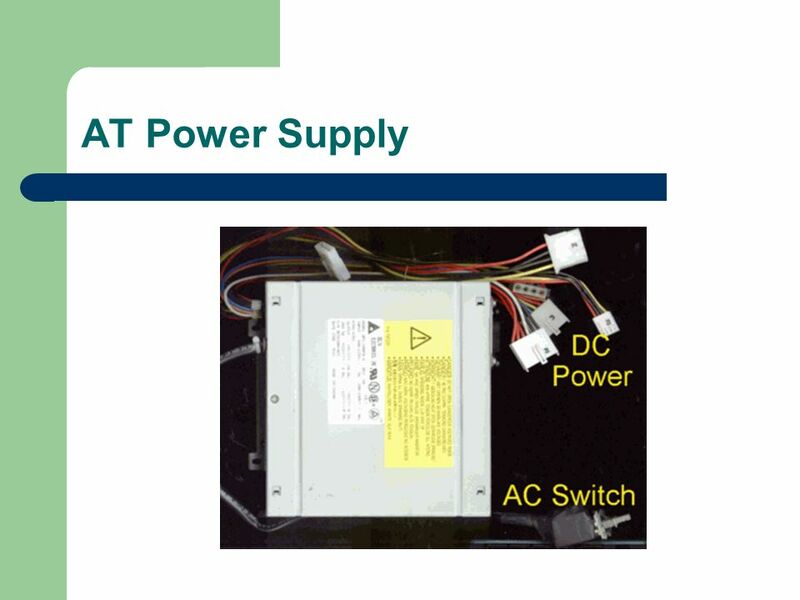 What are Power Supplies A power supply converts AC current from the wall socket to DC current to run the computer. AC current. CONNECTORS AND POINTS Elizabeth Viverette. 20-PIN P1  Main power connector for early ATX motherboards. LOGO. Types of System Boards  Nonintegrated System Board  Nonintegrated system boards can be easily identified because each expansion slot is usually. Configuring a PC. Installing the Mother board To Install the Mother board, fit it into the computer casing. You will then need to Insert 24 pin ATX power. Power Supply and Cases. 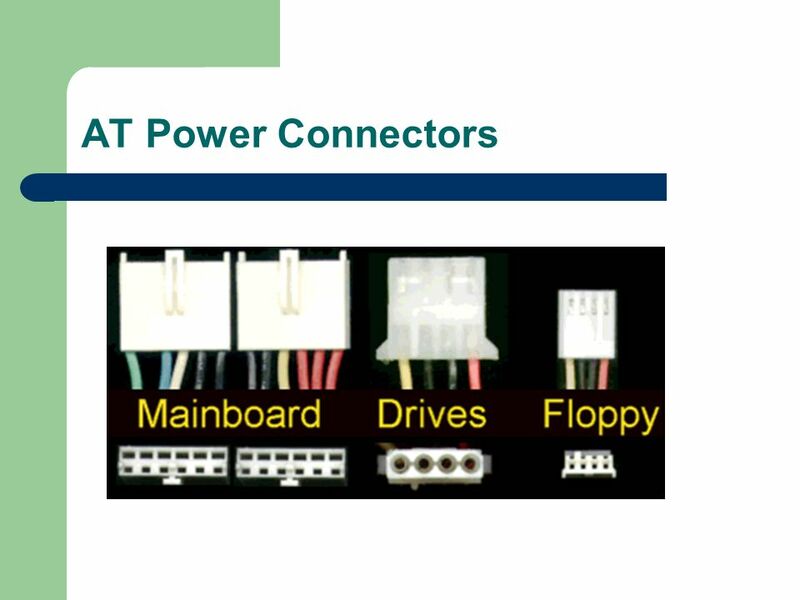 Objectives In this chapter, you will: -Learn about the various power supply form factors used in PCs today -Study the connectors. The Case: Computer vs. Human. Computer Case Contains the major components of the computer. It helps protect them from outside elements. Cases are usually. 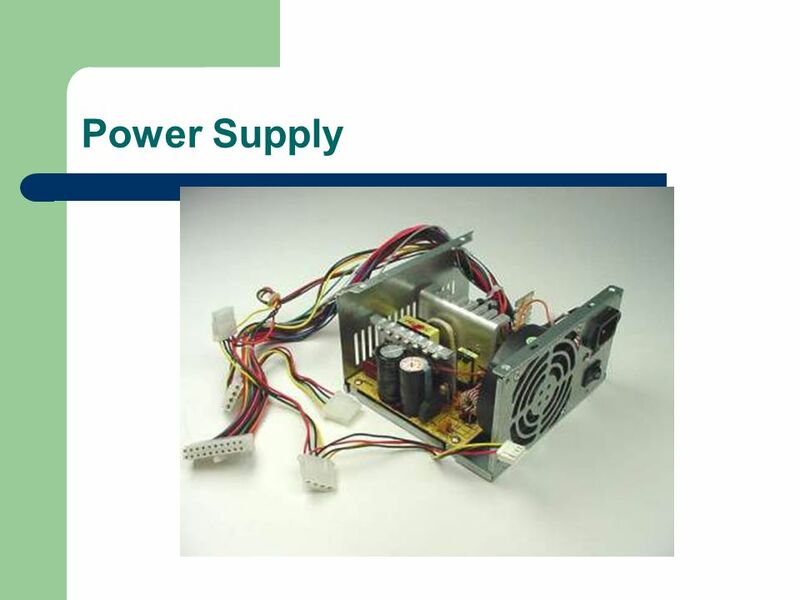 1 Exercise 7 The Power Supply. 2 The Power Supply.